Carlos Muñoz, veteran location scout for Netflix's Narcos, was shot and killed last week in a rural area of Mexico outside of Mexico City. The circumstances surrounding the death of 37-year old Muñoz remain a mystery at this time, but the area where he was scouting is apparently a notoriously violent area near the borders of Hidalgo state. In fact, the remote area is said to have the highest murder rate in Mexico. Investigators are having a hard time piecing together the circumstances that led to the brutal killing since there were reportedly no witnesses. The Hollywood Reporter revealed that Carlos Muñoz was found in his vehicle that had been hit with multiple gunshots. Munoz was working by himself in the dangerous area, but was considered to be a seasoned veteran in the field having scouted locations for numerous Hollywood movies that were filmed in Mexico. 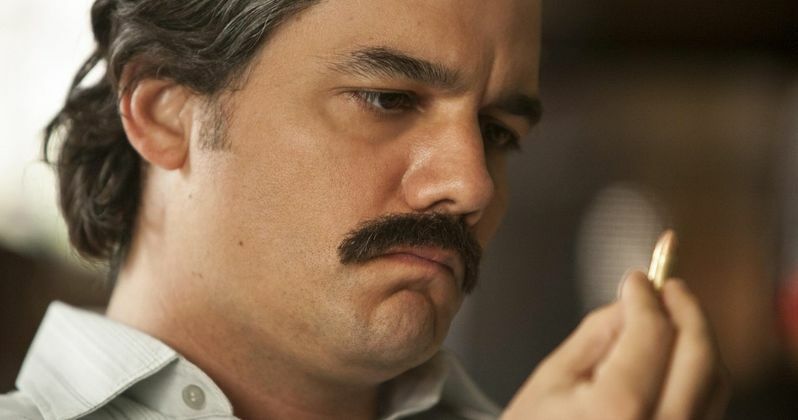 Muñoz's murder raises doubts to whether Narcos will continue to film in Mexico or possibly move back to Colombia, where the show started from. If that's the case, many crew members will lose their jobs, so the decision definitely will not be an easy choice to make. Netflix made the following statement. "We are aware of the passing of Carlos Muñoz Portal, a well-respected location scout, and send our condolences to his family. The facts surrounding his death are still unknown as authorities continue to investigate." Muñoz was a graduate of the University of the Americas and had been working in the movie industry for more than decade as a locations manager. Some of his past work includes Mel Gibson's Apocalypto and Specter, the 2015 James Bond film that begins in the Mexico city of Zocalo. Muñoz also worked on Sicario and The Fast and the Furious. Netflix's Season 4 of Narcos is said to be exploring the origins of Mexico's infamous Juarez cartel just as Narcos Season 3 focused on the rise and fall of Colombia's Cali cartel and ushered in the shift of the drug wars to Mexico. Drug-related violence has forced some movies and TV shows to relocate over the last 10 years. The area where Muñoz was killed had 182 cases of homicide in July alone, which is ridiculous and will no doubt lead to another safer location to be found when production starts back up for the hit Netflix show. In July, the Los Angeles Times reported that homicides in Mexico due to the drug war had spiked to record levels. More than 2,000 homicide investigations were opened in June 2017, which is an increase of 40% from the year prior, and an 80% increase since 2015. The investigation into Carlos Muñoz's death is still ongoing, but it is likely that the location manager simply found himself in the wrong place at the wrong time, leading to his untimely death. There is no word on what Netflix will decide to do in regard to filming Season 4 of Narcos, but that news is expected to be announced soon.